This morning, the husband was not happy when I made these delicious zucchini utthapams because he likes his dosas plain and simple. Then he looks at the date and goes ‘Ah! Z!’ It is amazing when the family is so into our mega marathon and it also is awesome that we have completed another mega marathon and posted 26 different dishes, one for each letter of the alphabet. This is the final one in my month long dosa series and with Z it had to either be one of zataar or zucchini dishes. I figured it is easier to get hold of zucchini. Since zucchini is a neutral tasting vegetable, I made these utthapams with a little ginger and onion and they tasted amazing. The daughter finished off two utthapams in a jiffy and that is proof enough. 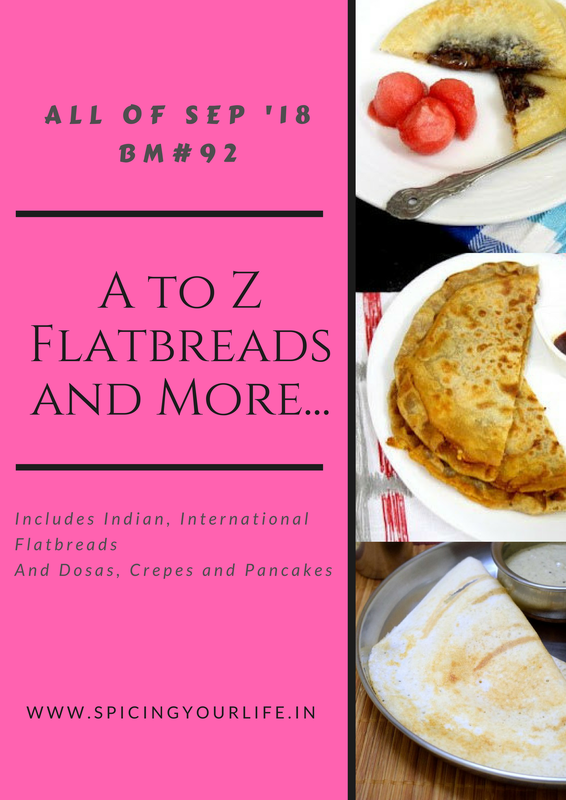 Uthappam with zucchini sounds like a lovely twist to our own usual uthappams.. What an incredible way to finish this A to Z Indian flatbreads na. You have done a beautiful job with many fabulous and interesting dosas. Kudos to you Sowmya. It can’t get any better, Sowmya. Love it when the family is aware of the blogging dynamics, right? It has been an amazing journey this month and I have loads of bookmarks already and I have already made one of them more to follow 🙂 Thanks a lot for doing this. WWow… love your bloglayout first.. Now come to dish. Its really looks so tasty and healthy… perfect way to add zucchini in meal. zucchini is rocking for letter z. surely this succhini utthapam must have tasted great. Yeah dear BM over and we made it. Zucchini is one of the perfect alphabet to fit in the Z slot of A to Z Marathon and this uttapam with it looks perfect . Glad the little kid gobbled these veggie loaded uttapam unlike other kids who avoid them . Today it is raining zucchini all over. Love this dosa so much. I prefer such dosas to the plain ones and no wonder your daughter ate it without any fuss. Yes I thought it was easy to go with zucchini than anything else..using it in dosa batter is a fantastic idea, I tried making a cheela..maybe next time..enjoyed your series Sowmya..
For letter Z I had two options only, zucchini and zafran. Zafran won as I love as I love saffron. Coming to your final flatbread, Sowmya, I’ve loved your dosas and didn’t know so many varieties existed. Zucchini Uttapam looks very delicious. I’ve soaked rice and dal to make a huge batch of batter so that whenever I run out of ideas what to serve hubby for dinner the batter will come to my rescue. The dosa looks so soft and yum. I add different vegetables to the dosa batter and next time will try Zucchini. Yum it is. The only choice i had was Zucchini and used it in the Roti.Adding it to the dosa sounds equally yum! Zucchini in the dosai batter is a lovely choice and it adds so much to the flavor of the dosai. A good choice to feed the kids.